Second Avenue and 17th Street north of Market Square has been home to a bank since the earliest days of Rock Island. The story owes much to “The First One Hundred Twenty-Seven Years,” a 1981 book by Lewis B. Wilson, who provides an excellent history of banking at this location. He notes that the very first bank in Rock Island County was Cook, Sergeant & Parker, which opened in 1852. Two years later, they located in a newly constructed building on this site. In 1856, Philemon Mitchell and his friend Philander Cable arrived on a train from Kentucky carrying $80,000 in cash, intending to buy a bank in Rock Island. They purchased Cook, Sergeant & Parker and renamed it Mitchell & Cable. After 1860, when Judge Cornelius Lynde, Jr. purchased Mr. Cable’s interest in the bank, it became Mitchell & Lynde for several decades. The 1850s and 1860s were a time of rampant speculation in Rock Island, due to the coming of the railroad that would link Rock Island and Chicago, and later a bridge linking us to the rest of America. Land values soared and plummeted. Banks were born and died. As a result, Mitchell and Lynde was the only bank operating in Rock Island between 1861 and 1863. In 1863, Mr. Mitchell and Mr. Lynde organized the first national bank in town, aptly named First National. It operated independently until 1890, when it was merged with Mitchell & Lynde. 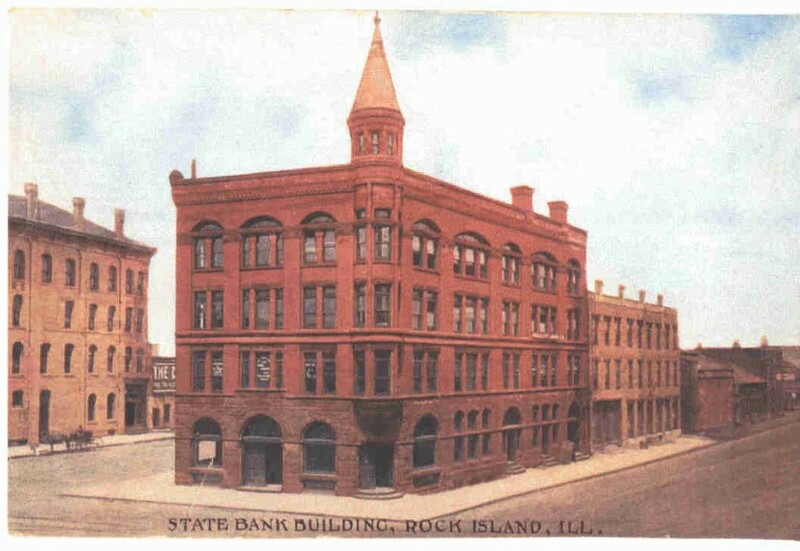 Other banks started and succeeded in Rock Island in the late 1800s, but this story must be confined to the bank that operated in the postcard building. Some accounts say the building shown on this circa 1908 postcard was the result of a remodeling of the Bailey & Boyle building, but Mr. Wilson tells us, “In 1891……a fine new building was erected on the old site.” Although the architect is not noted, it seems to be the work of Edward S. Hammatt, who worked extensively in this Richardsonian Romanesque style. The three-story building shown at the rear of the postcard is also part of Mitchell & Lynde’s block, while the group of smaller buildings closer to the river was used by People’s Power Company. The postcard clearly shows massive arches on the first floor, framed by the roughly textured stone that is characteristic of this style. Upper stories are of brick. We have seen close-up photos showing that every sharp corner uses a specially formed rounded brick. The building is especially interesting in its nearly equal emphasis on vertical and horizontal lines. Strong horizontal lines result from the bands of stone between floors and at the top as well in the understated cornice, which is inscribed “Mitchell & Lynde.” The windows are grouped into vertical columns, each group surmounted by an arch. The surprisingly delicate turret that begins above the corner entry carries the vertical line well above the rooftop, terminating in a steep “witches hat” roof. Close-up photos show delicate stylized foliage carved in the stone base of the turret and over the doorway as well. There is carving on the stones that create the arches, but in a simpler design. Notice the stairs at entrances on the long side of the building. These led to rented offices. Vintage interior views of the bank show it lined with marble of many shades. Dark marble wainscoting had round rather than square corners, emulating the exterior brick. Heavy brass grilles originally separated the bankers from their patrons, while leaded stained glass bowls hung from the ornately coffered ceiling to illuminate their transactions. In 1905, Mitchell & Lynde was renamed State Bank of Rock Island. The name change was followed in 1910 with a remodeling designed by the Davenport architectural firm of Temple & Burrows. That project enlarged the building and removed the turret above the roofline and installed the famous clock, now located on First Avenue. Both changes are documented in a 1915 photo. In 1946, the State Bank renewed the name of First National Bank of Rock Island. Although the old building was again remodeled to accommodate more facilities, it was later decided that a new building was needed. In 1961, the bank temporarily relocated to the basement across the street – now the Ann Goldman Building – while their old building was demolished and a new one erected. Their new building, occupied in 1963, was designed by the Rock Island firm of Stuhr, Parkhurst & Appier in the International Style. As a rare and well-detailed Rock Island example of this style, it is considered historic in its own right. This article by Diane Oestreich is slightly modified from the original, which appeared in the Rock Island Argus and Moline Dispatch on December 8, 2002.